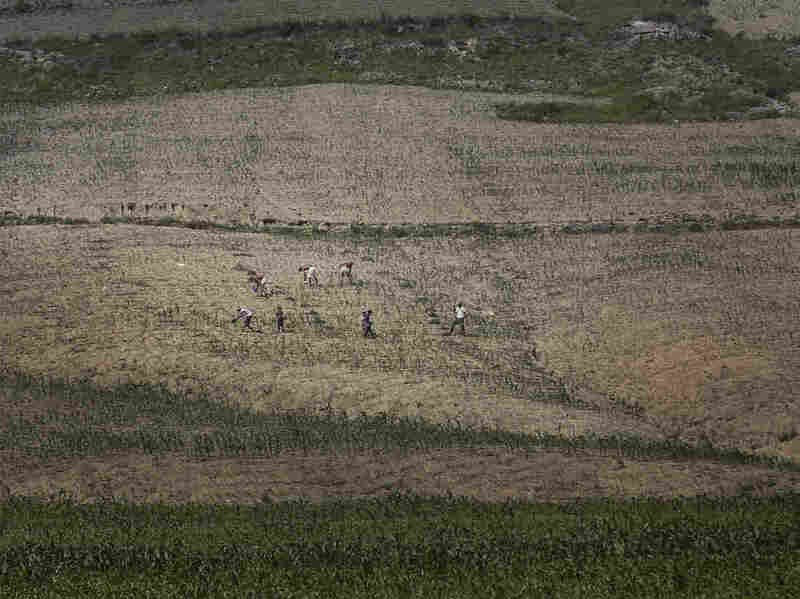 Is N. Korea Facing A Famine Or Just Seeking More Aid? : Parallels The country warned in June it faces its worst drought in a century. That's raised concerns — and some doubts about the severity of the situation. In the 1990s, 1 million died in a famine. Farmers worked in June in a cornfield in a southern region of North Korea that has seen unusually light rainfall this year. North Korea knows a little bit about drought and famine. In the 1990s, it's believed that up to 1 million North Koreans died in one of the worst famines of the 20th century. So when Pyongyang issued a statement last month saying the country is facing its "worst drought in 100 years," it was taken seriously. But Randall Ireson, a specialist on North Korean agriculture, says that prediction might be a bit overblown. "The phrase 'the worst drought in 100 years' is probably an exaggeration," he says. " 'Serious drought,' not an exaggeration," he says. Using rainfall data, Ireson has been analyzing the weather in North Korea. He says July normally sees heavy rain, but not this year. A tropical storm dumped about one or two inches of rain, but otherwise it's been dry. "When you get a year like this year, when there are long periods with no rain at all — and what there is is far below normal — then that's a serious concern and there is a stress on the crop," he says. 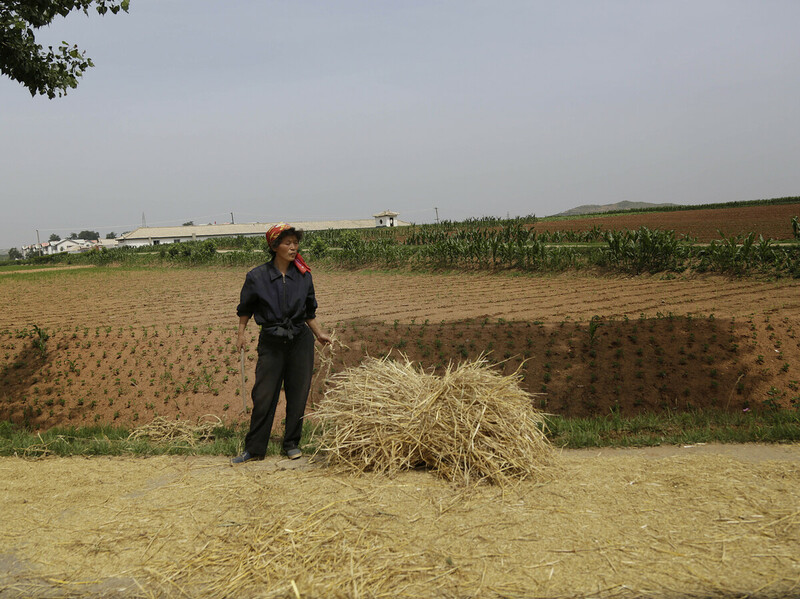 A farmer stands near a field in South Hwanghae, North Korea. Gauging the extent of the drought — like gauging anything in North Korea — is difficult because the country is sealed off from the rest of the world. Joseph Bermudez, chief analytics officer for AllSource Analysis, a commercial intelligence company, recently compared satellite imagery of North Korea from the past two years. Bermudez looked closely at the country's reservoirs. "The drought is different in different parts of the nation," he says. "If you look down in the southern part of North Korea, the reservoirs are anywhere from 20 to 30 percent of the levels they were in 2013." Bermudez calls that "a significant difference." The United Nations says the drought has already caused food shortages, and the government has reduced food rations by 100 grams (3.5 oz.) to 310 grams (10.6 oz.) per person per day. David Kaatrud, the regional director for the World Food Program, says more shortages are expected later this year. "At this point in time, some of the preliminary indications [are] we could have [a] significant reduction in the main rice harvest of up to 30 percent in some areas," he says. Kaatrud says any food shortage comes at a time when the World Food Program is already struggling to raise funds and resources to provide aid to the country. "We aim to serve about 1.8 million children and pregnant and lactating women," he says. "However, we've only been able to reach about half of that this year because of the tightness of resourcing." There are, he says, competing and "huge demands on the international donor community from Syria, Iraq, Yemen and other areas." While the drought may be affecting North Koreans now, it's unlikely to be on a comparable level to what happened in the 1990s. In large part, that's because the hardline Pyongyang government has made changes since then. In past years, farmers were given a small payment and fixed rations. Now, Ireson says, they are allowed to keep more than 30 percent of what they grow. "And we believe, [though it] remains somewhat to be seen, that they have permission to sell any of that excess on the open market if they're not going to consume it themselves," he says. But that's only if they have crops to sell. And at the moment, it all depends on the rain.